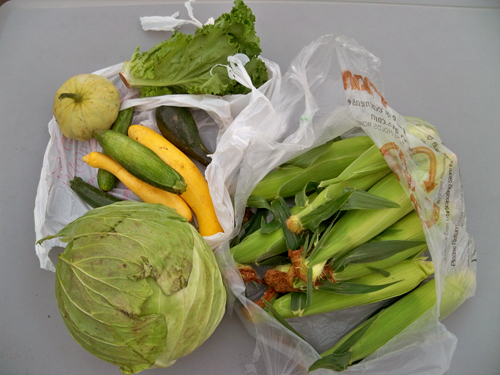 We have been getting a lot of corn with our CSA veggies and I wanted to make something different. After a little poking around I decided on Mexican grilled corn. 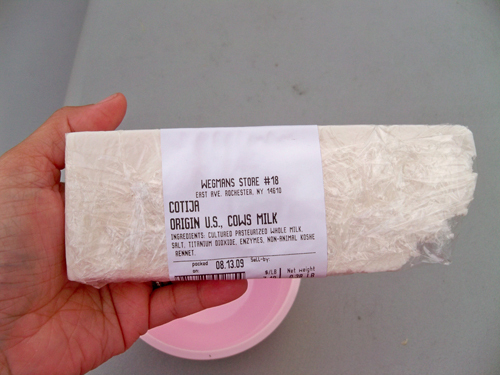 I even got cotija cheese - a Mexican cheese. It's pretty easy to make. Grill the ears of corn on the bbq grill. 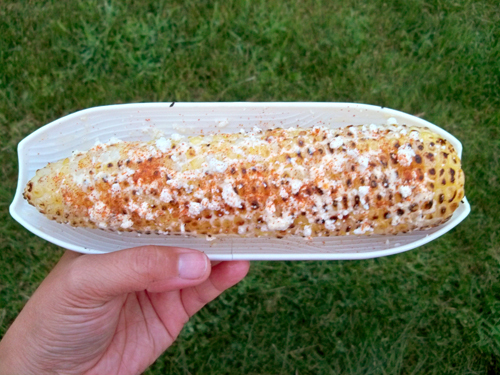 When it's nice and browned, roll the corn in melted butter, smear on some mayo, sprinkle with crumbled cotija cheese, sprinkle with cayenne pepper and then add a spritz of lime juice. That's it! Nom nom! cotija is my fave! i grew up eating that every day! how did you like the cheese?? I never had it before. I liked it! What else can I do with it? I had that at a cookout recently. Delicious! There is a church with a Mexican mass across the street and when the weather is nice they have vendors who sell different food items. 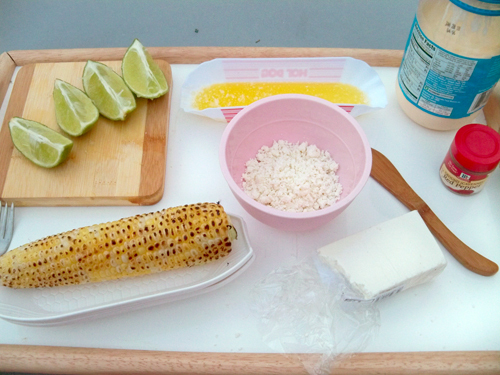 There is usually someone there selling the dish that you made - it is called elotes - but instead of eating it on the cob, they scrape the kernels off the cob and mix up all the ingredients in a cup and give you a plastic fork. Yummy! The latest issue of Cook's Illustrated has a recipe for this dish. I think their recommendations are to coat the ears of corn with oil mixed with chili powder before putting them on the grill and they either use sour cream in place of the mayo or use a mixture of both. I am not sure how I'll feel about the cheese but the idea looks worth a try! Thanks LJC. That looks so yummy! I love corn. My family used to grow some in the backyard, and we live in Sweden! But it worked fine and we had some tasty sweet corn during the summers. We ate it grilled and also cooked with crayfish, cajun style with lots of spices.